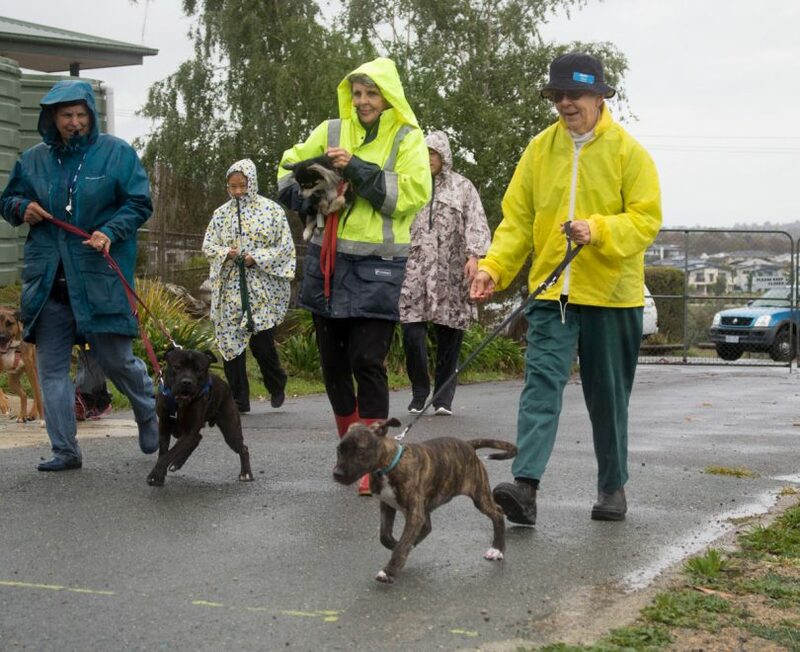 RSPCA ACT dedicated volunteers ensuring dogs are walked – even when it is pouring rain. As the ancient African proverb goes, ‘it takes a village to raise a child’ – but here in the ACT, it takes a community to run the RSPCA Shelter. With International Volunteer Day coming up on 5 December, it is the ideal time to recognise the RSPCA ACT volunteers as community enablers that help us run the shelter. We have just released data from our last financial year with homing rates in excess of 91 per cent. We would never have been able to achieve this, or care for the 3,302 animals that came through our doors during that period without the dedicated help of our volunteers. The RSPCA is one of many organisations that benefit from formal volunteering. According to Volunteering Australia, 31 per cent of Australians spend a staggering 12.2 million hours volunteering each year. Volunteering makes an estimated annual economic contribution of $290 billion. Canberra benefits from having the highest rate of volunteering in the country. We have 36.7 per cent of adults and 57 per cent of young people volunteering in the region. Volunteering at the RSPCA can be deeply fulfilling, but it is certainly not glamorous. Duties can include anything from scooping poop to walking dogs to cuddling cats to upholding the highest standards of governance. Regardless of the specific volunteering role, our Volunteers show up. We don’t have fair-weather volunteers. It is quite the contrary – many of our volunteering duties take place outdoors, and in all kinds of weather. 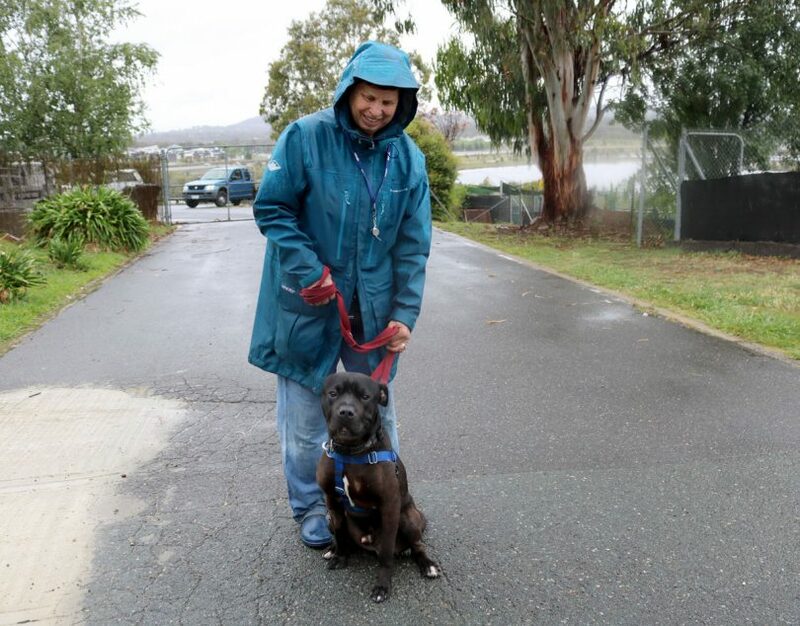 An RSPCA ACT longtime volunteer who shows up no matter the weather conditions. Running a shelter is a 365 days-per-year job. Many of our volunteers give up their weekends, their public holidays (including Christmas Day) to assist with the care of our shelter animals. There are 165 active volunteers at the RSPCA ACT. Some of these individuals have been with us for nearly 20 years. Millennials have been given much-deserved kudos for their commitment to, and advocacy of animal welfare, but we are proud that our baby boomers have been our loyal supporters for so many years, as well. Volunteer Board Directors also often don’t get the credit they deserve. Serving as an RSPCA ACT Board member is not all fluffy kittens and cute puppy cuddles. As most Directors have senior, full-time day-jobs, they attend Board meetings after-hours and on weekends and factor other key RSPCA meetings into an already full schedule. The RSPCA ACT is fortunate to have a high-calibre, and very engaged volunteer Board. Our volunteer Directors genuinely care for animals. They are willing to share their skills and knowledge and open up their networks to achieve the best welfare outcomes. Luckily, it seems that the sacrifices are worth it, as studies show that volunteering is good for you. The OECD Better Life Index says volunteers tend to be more satisfied with their lives because they are interacting with other people, setting and achieving goals, and learning new things. Some of our superhero volunteers. Most of the volunteering roles at the RSPCA ACT have a physical component. We all know that appropriate physical exercise and a good diet leads to lower blood pressure and increased physical health. Physical volunteering can now be added to that list. A growing body of evidence suggests that people who give their time to others might also be rewarded with better physical health—including lower blood pressure and a longer lifespan. Although there are mental health and physical benefits to volunteers, organisations definitely reap the lion’s share of the benefits. Without you, our most valued volunteer, we could not do what we do. To all the volunteers out there, especially the amazing folk who volunteer for the RSPCA ACT, you are all superheroes. Thank you for everything!